New Mexico School for The Arts (Santa Fe, NM). NMSA’s dual-credit agreements enable students to take courses for free at Santa Fe Community College and other four-year colleges in the state. Mastery arts training at NMSA are not “arts enrichment” programs, but full pre-professional, skill-building arts curricula. It is the only public, arts-focused high school in New Mexico with a Residential Program that gives students from across the state access to NMSA’s rich, highly motivated dual-track, rigorous academic and mastery arts education in Music, Dance, Theater, and Visual Arts. Every student who comes to NMSA is admitted into one of these four “majors,” based on passion, promise, and aptitude in that art form. NMSA students spend a normal school day in academic studies and at 2:00PM turn to their arts studies; they receive two-three hours of daily artistic training in their art discipline: after four years of study, every NMSA student will have accumulated approximately 1,980 hours of rigorous training, specialized coursework, and practical application. The Dance Department cultivates student physical, creative, and analytical growth through intensive dance training and education. Its curriculum is rooted in Classical Ballet with additional focus on Modern Dance, including Contemporary Dance, Dance in Community Settings, Dance Composition, Dance History and Culture, Gyrokinesis, Music for Dancers, Partnering, Pilates, and Jazz. 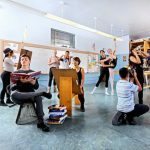 Dancers take classes with guest teachers and choreographers, work with guest artists, and explore cross-disciplinary collaborations, site-specific and staged performances, research and creative projects, and field and study trips. The Music Department, one of New Mexico’s premiere high school music programs, offers pre-professional courses to prepare students to enter competitive, post-secondary music programs. Coursework includes Music Theory, classic piano, ear-training, Composition, and improvisation. Every student in the Music Department receives weekly one-hour Applied Lessons with individual coach specialists in their area of study. While overall Departmental emphasis is on classical music, students experience other genres through studio classes, coaching from faculty and guest artists, as well as ensemble opportunities in chamber, choral, jazz, and orchestral groups that regularly perform in public. Close partnerships with professional organizations give students regular access to performances of internationally acclaimed soloists and world premieres. The Theater Department offers a diverse and rigorous curriculum to train the entire body, voice and mind, foster independent thinking, and prepare emerging artists for higher education and professions in theatre arts. Courses include voice and movement for actors, character development, playwriting, Shakespeare, scene study, theater history, acting for camera, directing, and monologue preparation as well as clown, elements (LeCoq), Alexander technique, Meisner, stage make-up, masks (larval, Commedia dell’Arte, etc. ), cinematic mime, and viewpoints. An ambitious production schedule gives every student numerous performance and production opportunities. Visual Arts students learn the fundamentals of visual communication by creating, presenting, and responding to art and design. Instructional emphasis is placed on skill development, critical thinking, risk-taking, craftsmanship and clarity of intention. Students graduate with a rigorous grounding in visual fundamentals, the ability to plan, organize, and execute self-directed projects, the ability to collaborate, and a strong sense of self and community. Disciplines include drawing, painting, printmaking, sculpture, photography, and media arts; art history and visual literacy courses supplement studio- based learning, as do exhibitions and collaborations with community partners and internships with professional artists. Students create and exhibit a body of work and final portfolio.